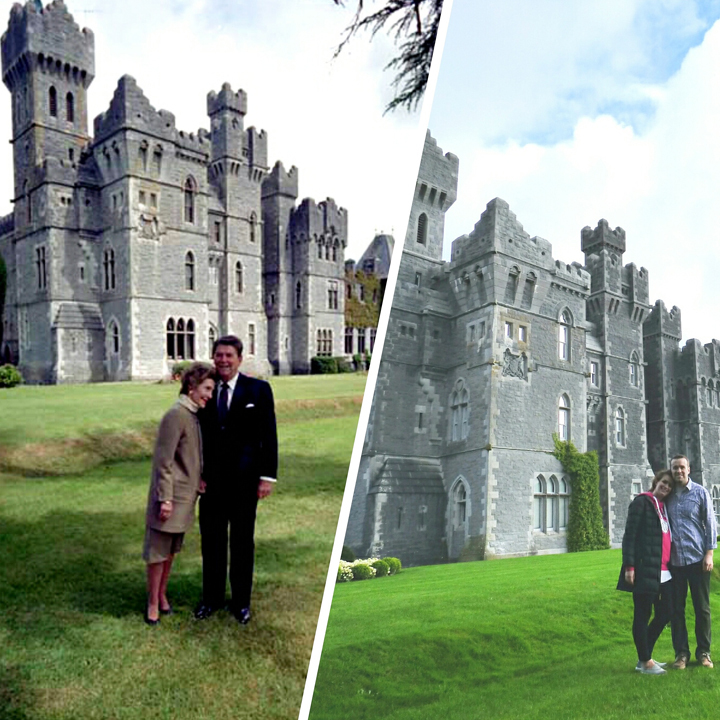 Our last destination in Ireland was Ashford Castle. It was an hour out of the way (so two hours round trip), but it was worth every second. You see, on September 7th 2012 (just a few weeks before Fox was born), Chris and I took a trip out to Simi Valley to go to the Ronald Reagan Presidential Library. 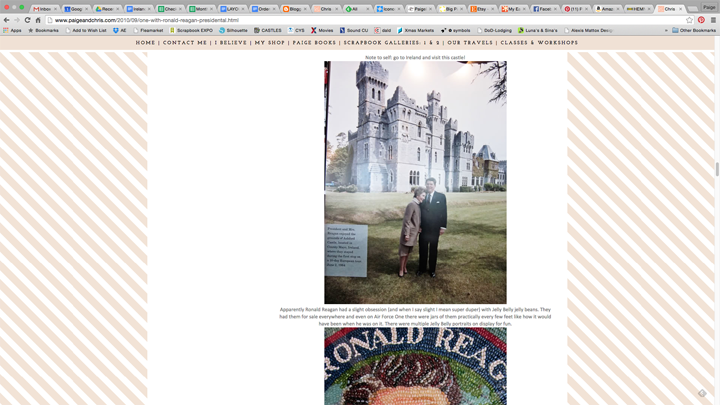 It was there we saw a picture of Ronald and Nancy Reagan in front of the Ashford Castle during his trip there in 1984. 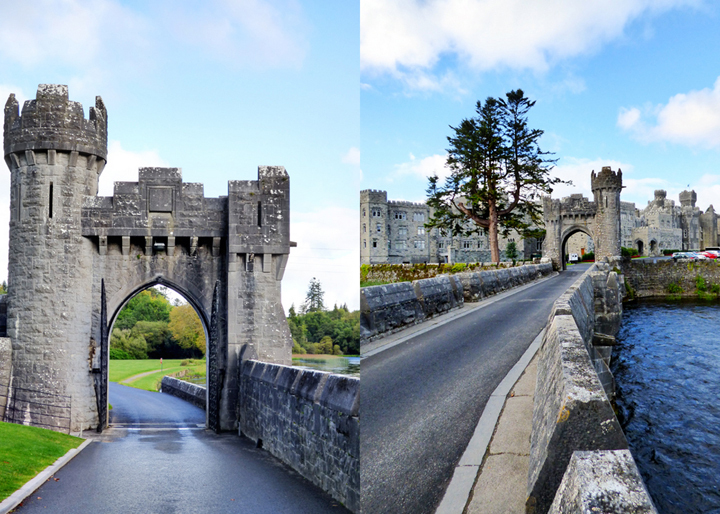 On my blog post recap I wrote: Note to self: go to Ireland and visit this castle! (never actually believing we would). But first, we had to get there! This is a typical "two-way" road in Ireland, no joke. Ireland is full of castle/church/abbey/etc ruins and we'd pass by them as we drove. They always looked so quintessentially Irish. After driving basically on a golf course (which actually ended up being the right way to go) we found it! There was a very nice old man selling admission tickets to the grounds who was more than happy to pose for a picture with us. Crossing the bridge to the castle. The front of Ashford Castle! The renovated Victorian castle is now a 5 star hotel and rents some of the finest rooms in all of Ireland. The original stronghold of the castle is on the far right of the structure and was built in 1228. The west wing additions were added when the castle was under the ownership of the Guinness family in the middle of the nineteenth century. The back of the castle. In 1715 while the castle was owned by the Oranmore and Browne family a French chateau style segment was added which is visible in the middle. The castle is now owned by a South African family and is one of the finest hotels in the world. The castle and grounds sit on the shore of Lough Corrib, the second largest lake in Ireland. Actor Pierce Brosnan of James Bond fame chose these gardens for his wedding reception in 2001. We actually looked into booking a room here for a night but it was completely sold out. Maybe for a future anniversary. The pool/spa area is enclosed in an awesome solarium. Peeking through the windows to check it out. Swanky! During the 16th century when the castle was used as a British fortress a fortified enclave was added. 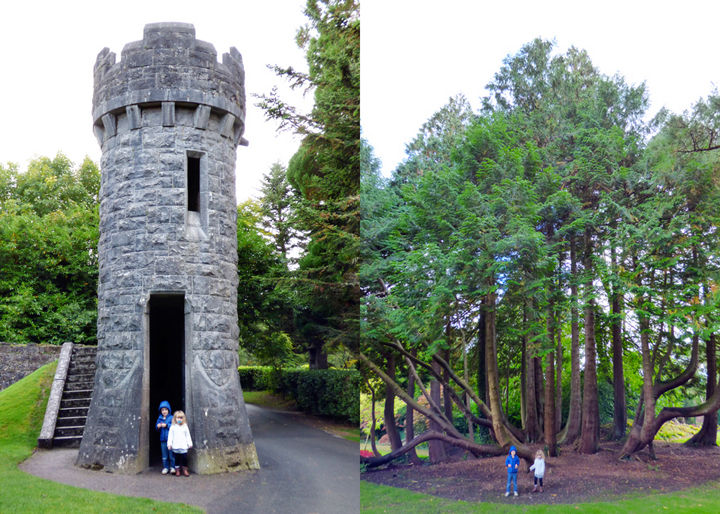 The kids exploring the lovely grounds. The estate covers a huge chunk of land and is full of paths, gardens, and outbuildings. There is even a school of falconry and an equestrian center. Pretty bench. I want one. "I'll be shootin' for me own hand!" 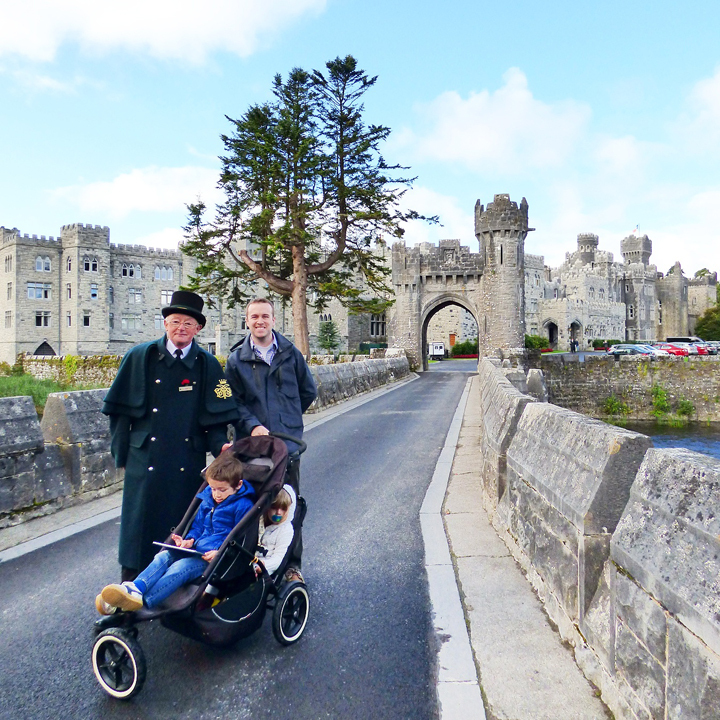 Our family at Ashford Castle on Tuesday September 22nd 2015. Looking at the bridge and castle as we made our way to the car. It was so fun to check off this long-awaited sight! The golf course. You can see the road we drove in on just to the left in the photo. As we were driving back east across Ireland towards Dublin we were able to get glimpses of Trim Castle, the largest Norman castle in Ireland dating from the 1220s. The castle remains impressive and was even used in the 1994 filming of Braveheart. The castle is built directly on bedrock and made for a very formidable defensive stronghold. We wanted to squeeze in one more sight before we retired to the hotel for the night so we attempted to find the Brú na Bóinne archaeological site but got hopelessly lost, then found it, but didn't find the right "it." To tour the site you have to go to the visitor's center then ride their shuttle bus over and take a guided tour. We couldn't find the visitor's center but we did find Brú na Bóinne so we were able to at least see one of the 5,000 year old passage tombs from afar. Then it was time to find our hotel just outside Dublin and enjoy our last evening on the Emerald Isle. 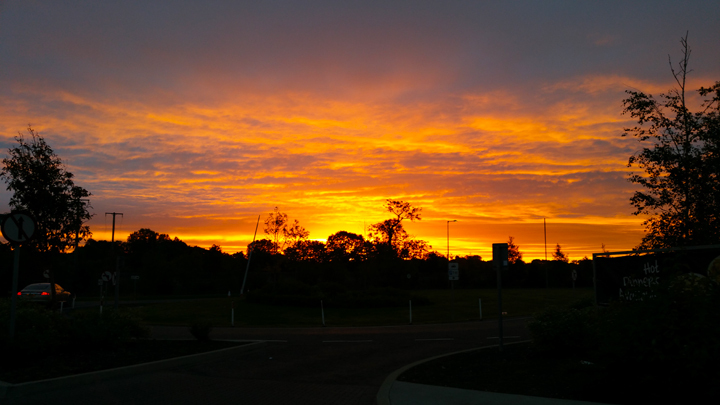 This is the sunrise that greeted us on our way back to the airport. Amazingly, we didn't get in a single car crash and turned in the rental car unscathed - glad to see that 3000 euro hold released from our credit card! Whew! And that concludes our adventures around Ireland! How exciting to get a photo just like Ronnie and Nancy's!! I saw that photo at his museum too!! And I can tell I am a LOT older than you ... cause I would have referred to Pierce Brosnan from "Remington Steele" fame! LOL!! LOVING all the photos!!!! I remember so well when we saw that picture at the Reagan Library. I'm so glad that we got to go. Thanks for humoring me and reenacting the picture. Love you!